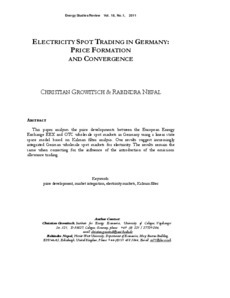 This paper analyses the price developments between the European Energy Exchange EEX and OTC wholesale spot markets in Germany using a linear state space model based on Kalman filter analysis. Our results suggest increasingly integrated German wholesale spot markets for electricity. The results remain the same when correcting for the influence of the introduction of the emissions allowance trading.